Do you know a child who wants to learn to scull? Most rowing shells are much too big for small children. 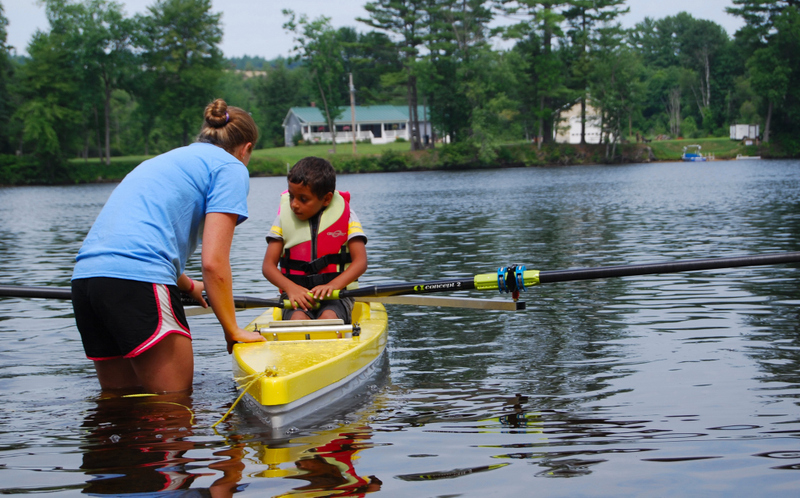 Now you can buy a smaller boat that is just the right size for learning to row. 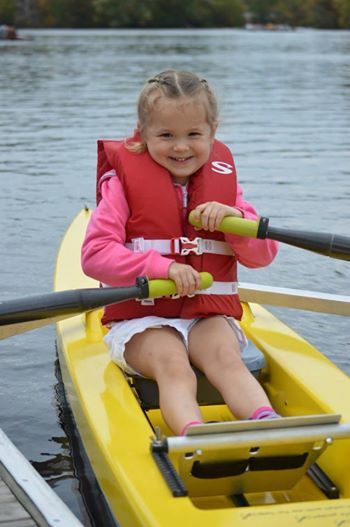 Little Sculling Boats™ are smaller and more stable versions of adult single sculling boats. They are perfect for young kids about age 5 and up, and some adults (up to 5′6″). Our current model fits a range from 35 lbs up to 200! We make the only sculling single for children this size, and the only one that will fit such a range. Our boats are perfect for learning to scull safely and well. A kid can learn to scull, turn and back, within an hour. Really! Our boats are smaller, lightweight, stable, and durable. We make the hull out of molded fiberglass. It is fitted with a sliding seat, adjustable foot board, aluminum riggers and Concept2® oarlocks. Anodized riggers for salt water use are available at additional cost. 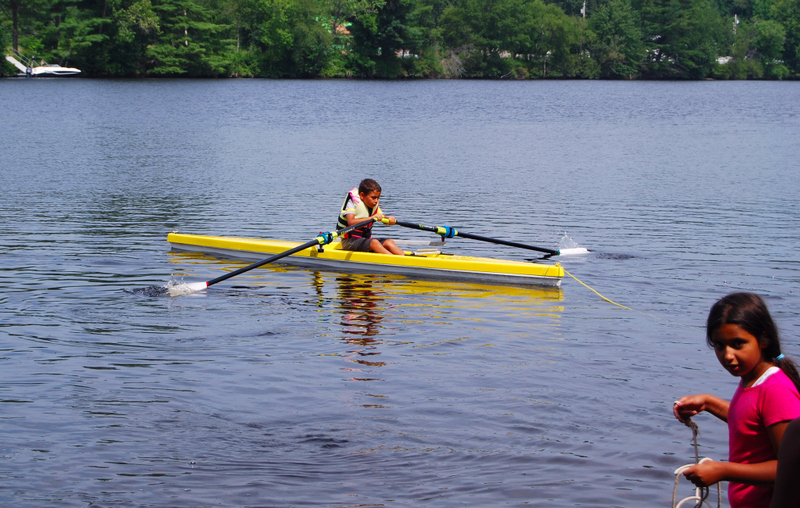 The Little Sculling Boat™ comes in bright safety yellow. 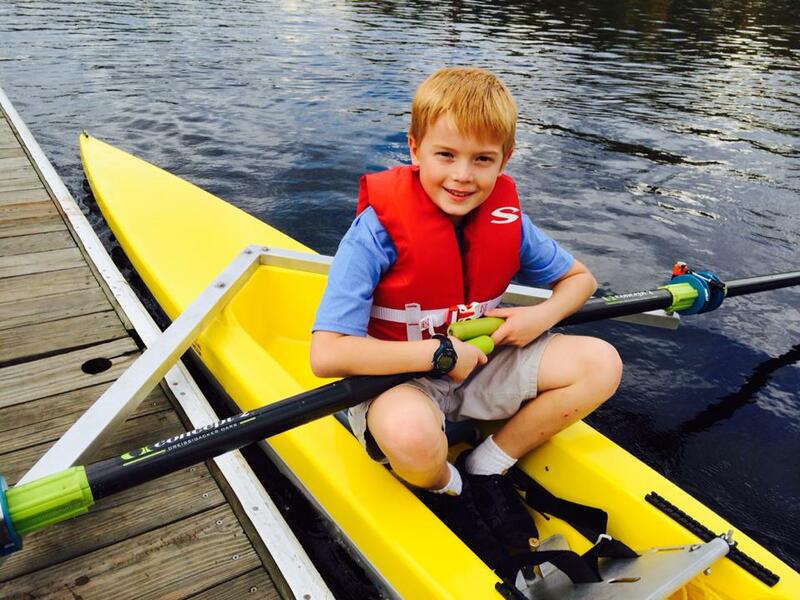 All Little Sculling Boats™ include oarlocks and Little Sculls made for us by Concept2®. All of our boats, sculls and parts are designed and built in the US. First time and already learning to back! Fiberglass boat (~ 35 pounds rigged) with sculls: $2775. Affordable, maneuverable, and great for learning and enjoying a lifelong sport. For Canada: Rowers World, in Ottowa, has a demo and is a distributor. Summer Day Camps: To find 1 week summer day camps, using our boats, see Kindersculls. They have camps throughout the Northeast US. Kindersculls is a traveling, half-day summer camp for 4-9 year olds. Each day includes warm-ups and stretching, lessons in equipment handling, safety, and sculling technique, a craft project, and lots and lots of rowing. A safety video link is above right and on the safety page. Great idea, finally something for the children. “Row as you grow” Can’t wait to see our future scullers.